British investigative journalist Clare Rewcastle Brown, who helped expose the 1Malaysia Development Berhad (1MDB) scandal across the Causeway, was briefly detained at 1am in Singapore this morning when officers found that she had been blacklisted against entering or leaving the city-state since 2016. 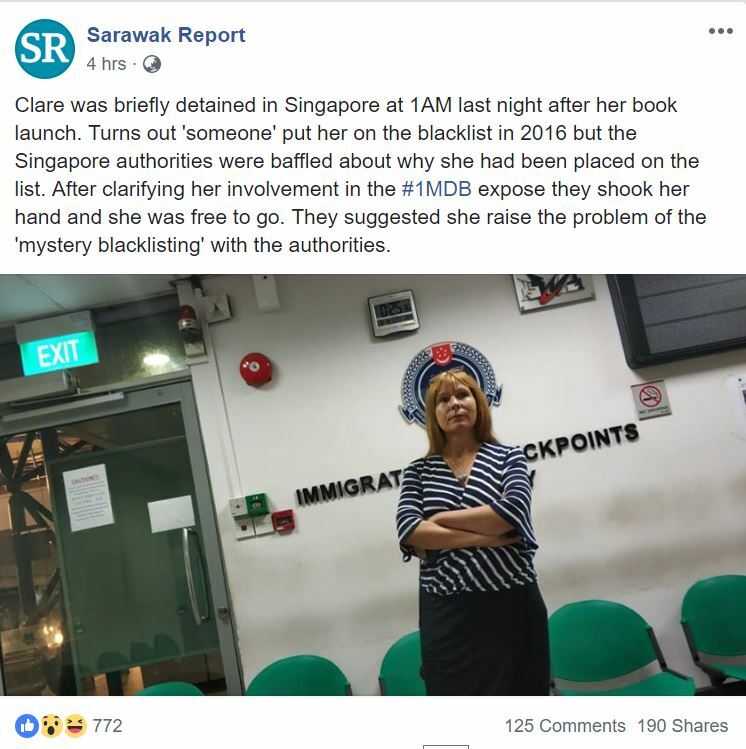 The publication Rewcastle Brown runs, The Sarawak Report, shared on Facebook: “Clare was briefly detained in Singapore at 1AM last night after her book launch. 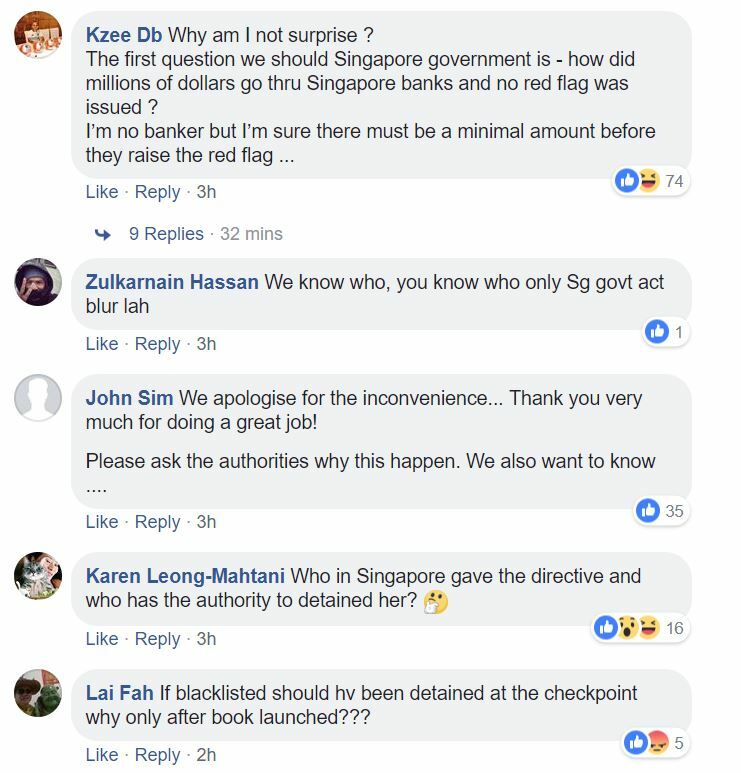 Turns out ‘someone’ put her on the blacklist in 2016 but the Singapore authorities were baffled about why she had been placed on the list. 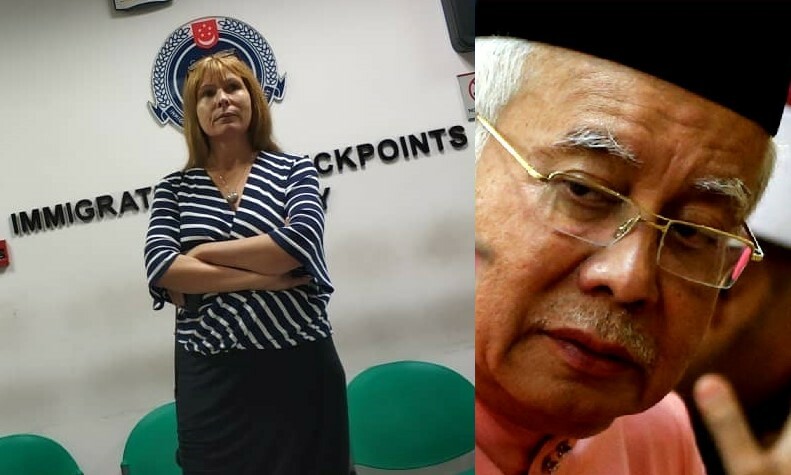 Rewcastle Brown had been in Singapore to launch her book ‘The Sarawak Report’ that takes an inside look at the 1MDB scandal that shook Malaysia. The book launch was held yesterday at The Agora. Sarawak-born Rewcastle Brown is considered a “heroine” by many in Malaysia due to her work helping to expose the 1MDB scandal as well as other scandals from the Sarawak and Sabah region. 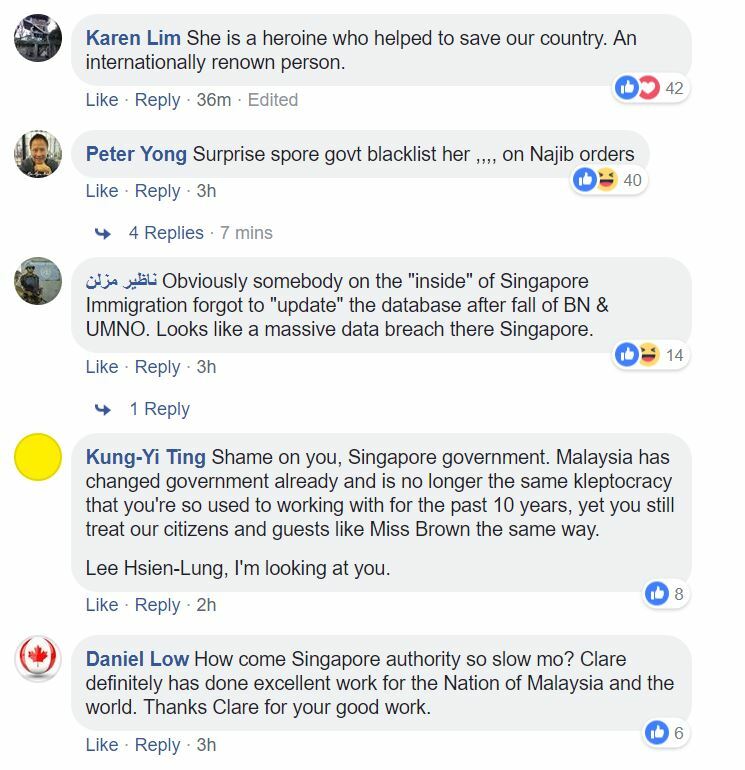 Rewcastle Brown’s mysterious blacklisting comes after a series of travel bans that were set against her by Malaysian authorities in the past. In July 2013, the journalist was barred from entering the Kuching International Airport and was put back on a plane for Singapore after being detained at the airport. Two years later, on 1 August 2015, ex-Malaysia Prime Minister Najib Razak addressed UMNO delegates in Seremban and in a clear reference to the Sarawak Report, demanded that “white people” stay out of Malaysia’s affairs. Following a series of exposés by Sarawak Report regarding the 1MDB scandal, an arrest warrant was issued by a Malaysian court in August 2015 for Rewcastle Brown.The arrest warrant was obtained for her alleged involvement in “activities detrimental to parliamentary democracy” and the “dissemination of false reports”. Responding to the arrest warrant, Rewcastle argued that it is the Malaysian government who is “detrimental to parliamentary democracy” by suppressing free speech (closing down two newspapers) and arresting people who officially engaged in the 1MDB investigations. After the ruling Barisan Nasional was defeated and Pakatan Harapan took power during 2018 Malaysian general election, an arrest warrant for Rewcastle Brown was lifted and she was able to set foot on Malaysia again on 18 May 2018.